So I tried it at the funeral. I held tight to that heart in my pocket, reminding me I was strong and OK to have feelings too. I did it. I cried in front of people, even felt so messy in front of people. Very hard for a shy girl. And I didn’t make myself talk when I didn’t want to. Definitely no talking from the pulpit either. Yikes. I let it be OK just to be. And I realized being me was a strength. It felt OK, even strong. This was such a revolutionary concept for me at the time. At the same time, other parts of my life were very challenging, so I was overwhelmed on many levels. This one lesson of opening my heart helped me get through it all, eventually. It was a slow process of recovery, to be sure. But all along the way, I was letting my heart melt in a new way, and I knew that was good. It felt good and it was helping me in so many ways. It changed me for the better. I had my heart broken open. And that, makes you stronger! Not weaker! An open heart helps me in close relationships and beyond. It helps me share myself openly, such as when I started a business and launched this blog, revealing my vulnerabilities to the world. The more I turn to my heart and let it out in the open, the stronger I feel, and the happier I feel. And the more successful I am in my work! It’s not something I would have predicted, but it works. Do you believe opening your heart can make you stronger? Think about it. 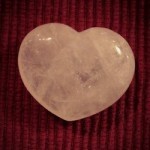 If it’s a struggle for you, I recommend the rose quartz heart in your pocket. Little by little, you will gradually enjoy the benefits. The thought of opening up is far more scary than the opening itself. Originally published on February 14, 2014. Last revised on December 8, 2014. Posted in Introvert Power, Natural Flow and Balance | Tagged fear busting, heart-centered, open-hearted | Bookmark the permalink.